Travel high up into the clouds and take a walk on the giant observation deck, perched atop three towers! 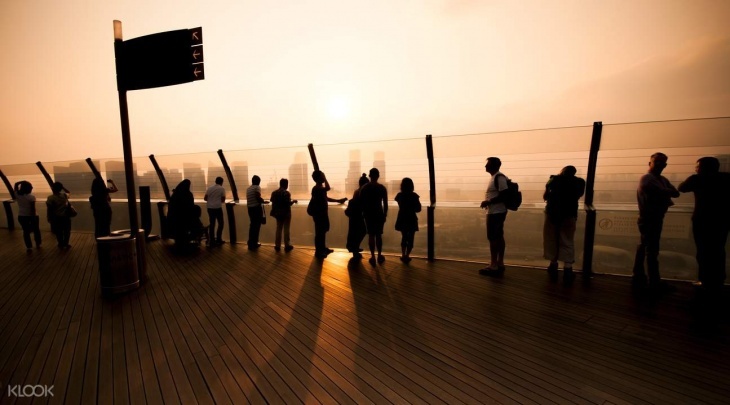 See Singapore from up high at Sands SkyPark Observation Deck. Perched 200 meters in the air, this stunning view point is the peak and zenith of Marina Bay Sands. Taking you 57 levels high and offering an unrivaled panoramic view of the metropolis, Sands SkyPark Observation Deck is an absolute must-see for all travelers to Singapore. Designed by a visionary Moshe Safdie, the SkyPark seems to simply float atop the three soaring hotel towers. The gravity-defying platform is the one of the largest in the world and is the best place in Singapore for a memorable photo session.